Press to play: Is gaming as addictive as heroin? Please note: The following blog was first published earlier today on the GamaSutra website. The original article can be found here. “Gaming addiction has become a real issue for the psychologists and medics over the last decade. The good news is that playing excessively doesn’t necessarily mean someone is addicted – the difference between a healthy excessive enthusiasm and an addiction is that healthy enthusiasms add to life whereas addiction takes away from it”. This quote I provided did not appear anywhere on the double-page spread (probably because it didn’t fit the main thrust of the article). 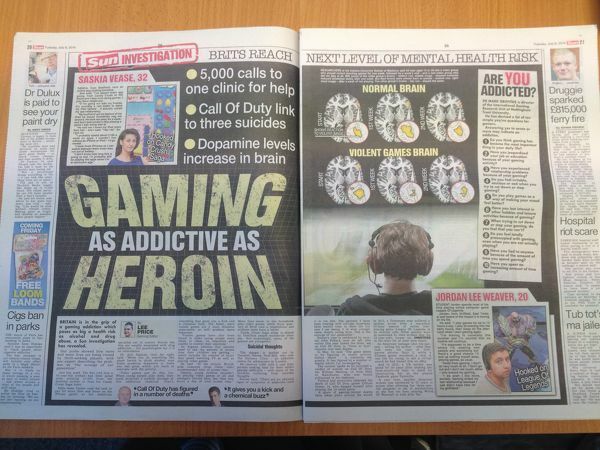 The headline “Gaming as addictive as heroin” (almost certainly provided by someone other than the Gaming Editor) was arguably more sensationalist that the article itself. Any regular readers of my blog will know that I believe gaming addictions exist but that the number of gamers that are genuinely addicted comprises a small minority. The Sun’s story began by claiming that: “Britain is in the grip of a gaming addiction which poses as big a health risk as alcohol and drug abuse”. The article also alleged that a London-based clinic claimed it was receiving 5,000 calls a year from parents seeking help for their child’s gaming addiction (I myself get around 2-3 calls or emails a month). It also featured a number of case studies claiming they were addicted to social networking games (like Candy Crush) and online multiplayer games (like League of Legends). There were also a number of references to alleged gaming-related deaths including the recent story that a coroner had linked three male suicides to playing the game Call of Duty. “It depends how you define addiction in the first place. I’ve spent my whole career trying to say if you’re going to call something an addiction it has to be similar right across the board. The criteria I use for video game addiction would be exactly the same as in heroin addiction in the sense that this is an activity that becomes the most important thing in your life, it compromises everything else in your life including your relationship, work and hobbies. It’s something you use as a way of modifying your mood. It’s something that builds up tolerance over time, so you need more and more. It’s something where you get withdrawal symptoms if you’re unable to engage in it. And it’s something that if you do manage to give up for a short time when you do the activity again you relapse. The good news from my perspective is on those particular criteria, the number of genuine video game addicts is few and far between. If we’re talking about genuine video game addiction, it doesn’t matter what the activity is if we’re using the same criteria. It’s a bit like that trick question my physics teacher used to give us, which was, if you’ve got a ton of feathers and a ton of lead, which weighs heavier? Most kids put down a ton of feathers, but the whole point is it’s a ton. It’s quite clear that some, whether it’s kids or young adults, have some problems around the fact they seem to be unable to control the amount of time they spend gaming, and maybe it’s impacting other areas of their life. But just because there are some addictive-like components there it doesn’t mean they’re genuinely addicted”. “I’ve spent well over 25 years studying video game addiction. If we’re going to use the word ‘addiction’ we have to use the same concepts, signs and symptoms we find in other more traditional addictions, like withdrawal and tolerance. By doing that the number of people who end up being addicted by my criteria are actually few and far between. The [ten questions] I did for The Sun is actually based on real criteria I use in my research. The number of people who would score seven out of 10 of those items I put in The Sun today, I’d find it very hard to believe there would be more than a handful of people out there that would score high on all those things. You’d probably get a lot of people who might endorse three or four of them, but that doesn’t mean they’re addicted. That might be somebody who has problems with it. Most kids can afford to play three hours a day without it impacting on their education, their physical education and their social networks. Yes, I believe video game addiction exists, and if it is a genuine addiction it may well be as addictive as other more traditional things in terms of signs, symptoms and components. But the good news is it is a very tiny minority who are genuinely addicted to video games…There is no evidence the country is in ‘the grip of addiction’. Yes, we have various studies showing a small minority have problematic gaming. But problematic gaming doesn’t necessarily mean gaming addiction. They’re two very separate things. Yet the media seem to put them as the same…Every time I do a piece of research, if it’s something that’s negative, 90 per cent of the press cover it. If it’s something positive, 10 per cent of the press cover it. Bad news stories sell”. Speaking to the press (and writing journalistic articles for the press) is something that I do on an almost daily basis and I will not stop doing it as I believe that we as academics have a public duty to disseminate our research findings outside of academia and to the general public. As I noted in a previous blog, I’ve had a few horror stories when what I’ve said is taken out of context but a few bad experiences are never going to be enough to put me off sharing my work with the mass media. Finally – and as promised above – here are ten simple ‘yes/no’ questions about gaming that I had published in The Sun. If you answer ‘yes’ to seven or more of them, in my view, you may have a gaming addiction. Do you think gaming has become the most important thing in your daily life? Have you jeopardised your job or education because of your gaming activity? Have you experienced relationship problems (with your partner, children or friends) because of your gaming? Do you feel irritable, anxious or sad when you try to cut down or stop gaming? Do you play games as a way of making your mood feel better? Have you lost interests in other hobbies and leisure activities because of gaming? When trying to cut down or stop your gaming, do you feel that you can’t? Do you feel totally preoccupied with gaming (for example, even if you are not actually gaming you are thinking about it)? Have you lied to anyone because the amount of time you spend gaming? Have you spent an increasing amount of time gaming every day over the last six months? Griffiths, M.D. (2013). Video games make us better people. The Sun, February 1, p.8. King, D.L., Delfabbro, P.H. & Griffiths, M.D. (2009). The psychological study of video game players: Methodological challenges and practical advice. International Journal of Mental Health and Addiction, 7, 555-562. King, D.L., Delfabbro, P.H. & Griffiths, M.D. (2010). The role of structural characteristics in problem video game playing: A review. Cyberpsychology: Journal of Psychosocial Research on Cyberspace. Located at: http://www.cyberpsychology.eu/view.php?cisloclanku=2010041401&article=6. King, D.L., Delfabbro, P.H. & Griffiths, M.D. (2010). Cognitive behavioural therapy for problematic video game players: Conceptual considerations and practice issues. Journal of CyberTherapy and Rehabilitstion, 3, 261-273. King, D.L., Haagsma, M.C., Delfabbro, P.H.,Gradisar, M.S. &, Griffiths, M.D. (2013). Psychometric assessment of pathological video-gaming:A systematic review. Clinical Psychology Review, 33, 331-342.